So you’ve adventured your way through Alaska’s unforgettable parks, spotted elusive wildlife, and traversed the Last Frontier’s gorgeous glaciers. Now, it’s time to kick back with a cold one. A very, very cold one. For one of the most iconic and unique Alaska experiences, slide on down to the Aurora Ice Museum and Bar near Fairbanks. The clear, colorful carved beauty of the ice museum and bar is an unforgettable excursion to a fascinating, fun (and photogenic) place. The Aurora Ice Museum and Bar is located outside of Fairbanks. Try this Princess excursion to the ice bar while you’re staying in the city. It’s a scenic drive with wildlife sightings likely – you might get to see moose and bears browsing along the road. And once you’re at the resort, you might even see a few famous faces as well. The Ice Bar is a popular attraction for everyone visiting Fairbanks. 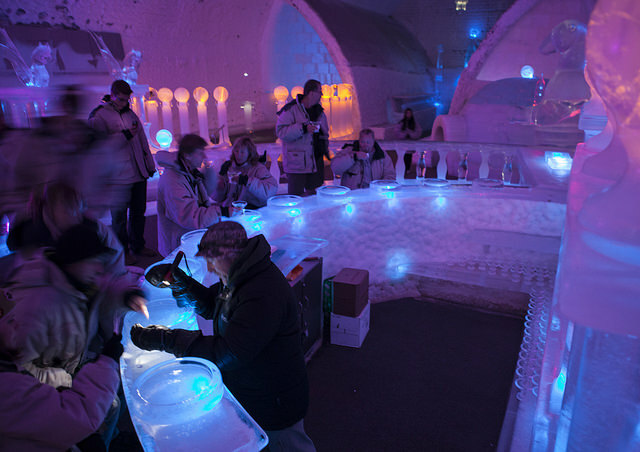 Even if you’re visiting the museum during the middle of summer, you’ll want to wear a parka – the ice museum and bar is kept at a frigid 25 degrees to ensure the delicate wonderland stays intact. But don’t worry if you forgot to pack your own – the bar will provide one for you (just like at a fancy restaurant where you forgot your jacket and tie). When you enter the museum, you’ll be leaving the land of the midnight sun and stepping into an icy wonderland. The Aurora Ice Museum Gallery is a dreamland of luminous ice sculptures, a two-story observation tower with circular staircase, ice furniture, ice chess, a polar bear bedroom, jousting ice knights – all surrounded by ice-block walls and glowing pillars. The ice sculptures in the museum and bar are the creation of world-champion carvers Steve and Heather Brice who compete in the World Ice Art Championships in Fairbanks each year. Inspired to try your own ice sculpture? The Brices also have a year-round workshop on the museum property. Take an ice-carving workshop! A two-hour class with a maximum of three students is $180 per person. If you’re stone-cold serious about learning the craft, three-day classes with accommodations also are available. After you enjoy the frozen sculptures around you, sit at the ice bar and sip an appletini in a carved-ice martini glass to warm you from the inside out. The half-moon-shaped bar is circled by about a dozen ice stools (which are thankfully covered by caribou fur), so there’s room for you and your friends. You probably don’t want to try dancing on the bar, though, because you’d need either crampons or skates. Have your photo taken at this iconic landmark. That way you can remember it while you’re sweltering in a humid August afternoon and need to visualize a chilly place. Tours of the ice museum are offered five times daily every day, all year long. So any day of the year you can enjoy your favorite cocktail on the rocks. Now that you know all about the famous Aurora Ice Museum and Bar, you can add it to your list of things to do when you see Fairbanks. Also, check out our blog for other one-of-a-kind Alaska experiences.